It's summer vacation time around chezTECH. As has been usual for the past few summers, the blog remains on line, complete with indexes, but no new posts are put up for a couple of months. The garden calls and I must answer. a pair of mittens coming out in a nationally distributed print magazine: uber-warm and lined a whole new way. As for the blog, we'll start with a unit on picking up stitches: new tricks to avoid puckers and jagged edges, as well as other tricks to make picked-up stitches lie smooth and professional-looking, whether along a horizontal or sloped or curved edge. Cables and further information about smoothly installing zippers are also on the horizon, so stay tuned. On a community knitting board recently, a member wrote that she can never divide for a V-neck without getting a loose stitch at the division point. Here are several cures to avoid the problem, plus a couple of after-the-fact corrections if you already have this problem. First trick: TECHknitting blog has already shown one trick for getting rid of that loose stitch by crossing stitches from one side of the division to the other. This works splendidly, but has the minor drawback of leaving a little pucker. R front first. To begin L front, add yarn (red dot) at the armhole, as shown. This prevents loose stitches at the division point of the "V."
Third trick: Patterns often call for you to place, not only the sts for the second front on a holder to work afterwards, but also to include on the holder, the center stitch(es). Once the second front has been transferred off the holder in order to knit it, these center sts remain on their holder. Finally, when both fronts have been worked, these center sts form the base for the center column(s) around which the neck ribbing is decreased. The problem is, as these center sts hang on their holder and get pushed around, they tend to accumulate whatever slack is around them. By the time you finally come to knit these center st(s), so long neglected on the holder, they have often grown larger, and sometimes much larger. So here is a little trick to prevent growing. The idea behind this trick is to put less yarn into that location in the first place. See, when you make an ordinary knitted stitch, its size is determined by the diameter of the knitting needle around which the st has been formed. What if we could make a st without wrapping it around the knitting needle? That st would be smaller and tighter than the others around it. Here's how. When you come to these center sts in the row in which you're going to make the division, knit the first (blue) then skip knitting the second (black). If there is only one center st, skip that one. Instead, bring the running yarn (red) to the back, slip the skipped st (black) and then continue knitting. When the time comes to put the center st(s) on the holder (shown as a safety pin in the illustration below), the holder goes through the blue and the black stitch, while the red length of yarn remains loose, behind the black st. When you finally come to knit these two center stitches (usually, as part of the neck ribbing) you would first take a crochet hook and draw the slipped red yarn though the black stitch, thus making a knit stitch without having wrapped it around a knitting needle. 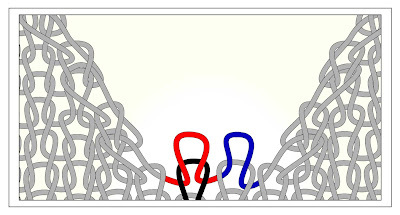 In other words, by drawing the red strand through the black stitch, you are, in effect, knitting the black stitch with the short length of slipped red yarn, and this stitch is therefore formed out of a shorter length of yarn than would have been possible had the st been formed around a needle. Because this stitch is created with less yarn than a normal stitch, the new red stitch pulls excess yarn from its neighbors. 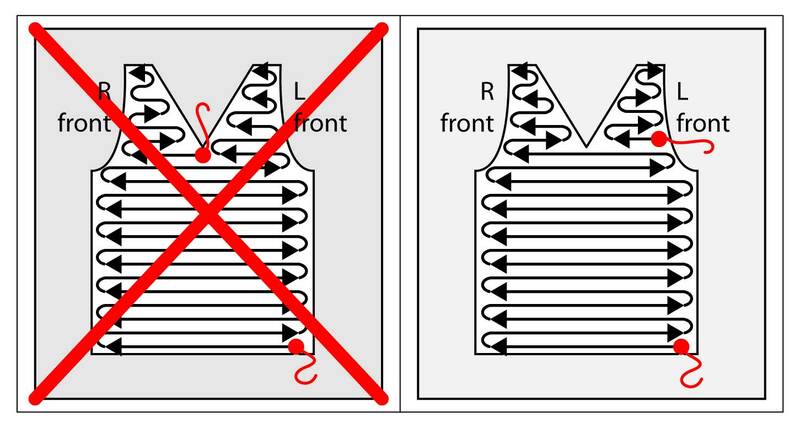 This forces the center stitches to be nice and tight, and reduces the possibility of loose loops at the center bottom of the v-neck division. Have you seen this slipping trick before? It is a variation of a trick for avoiding loose yarn where a purl column and a knit column come together, solution 4 (scroll). If you already HAVE a loose stitch at division of your v-neck then, with your knitting needle, pick away the slack, losing it in the neighboring stitches on both sides (actually, this is a wonderful trick for tightening any loose stitches, however formed and wherever located). 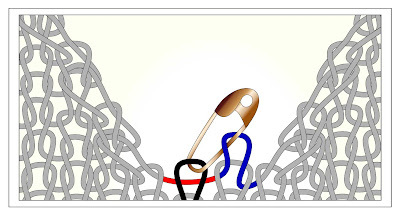 If there is SO much slack that it is not possible to lose it in the neighboring stitches, pull the slack up into a loop. If the loops is truly ginormous, you can actually just thread the doubled yarn at the top part of loop itself through the eye of a sharp needle (use this trick to thread such a short length) and skim in the upper end of the loop, thus stretching it out and permanently removing the excess slack yarn. 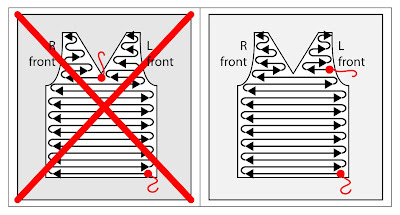 If the loop is too small to skim in the top of the actual loop itself, then thread the sharp needle with a length of matching yarn and tack (tack=sew lightly) the top of the loop down to the inside of the fabric in a stretched position--this tightens up the loose stitch permanently and will not show from the outside.